There’s nothing wrong with Craigslist, really. There’s the occasional dishonest work from home scams, but you can unfortunately find those everywhere. Still, you may want a few other options for selling or buying items. Craigslist is one of the go-to places for finding stuff to buy, selling unwanted stuff, adopting a new pet, finding a rental home, and yes – even finding legitimate work from home jobs. Don’t think that, just because Craigslist may be the most well-known site of its type, that it’s the only one. There are plenty of sites like Craigslist but free also. These ad websites that are similar to Craigslist can give you more options for finding or selling what you need. You may even find a more local Craigslist alternative on this list! Even if you have Craigslist’s rules nailed, you need to understand that a new site means new rules. You may have to tweak your ads to fit in with the website’s specifications. Never post any identifying information (full name, e-mail address, home address, etc.). Make an engaging, catchy title that makes your post stand out. Give a reason for selling your item, like you upgraded so you no longer have a use for it, so people don’t think you’re selling it because it’s defective. Be specific about the item’s details. Note anything that’s wrong with it to avoid a hassle with the buyer later. Research similar items to make sure you’re not over or underpricing your item. Respond quickly to questions about your ad. Repost your ad every 3-4 days (if the site allows) to keep it bumped to the top. Keep descriptions short, but appealing. Upload photos whenever you can. Buyers like to see the items they’re interested in and you’ll likely get a lot more attention on your ad. Always meet a buyer in daylight in a public place, rather than at, or near, your home. Looking for a Craigslist Alternative? These Websites Like Craigslist Are What You Need! As the name suggests, 10 Day Ads lets you post free ads in its classified listings for 10 days, so there’s no chance of seeing super old listings. You can also choose to list your ads in multiple locations, all over the world, rather than just your local area, to get more exposure. This website is interesting because it lets you post photos AND videos, which is especially helpful if you want to prove to people that your item works. Best of all, buyers can provide feedback, which helps weed out potential scammers or dishonest posters. Ad to Ad offers free ad posting for residents of the US and Canada. It’s heavily focused on ads for services, like computer repair or construction, and it seems that this is where it gets the bulk of its ads. There’s a lot of sub-categories to each main category, so make sure you list your ad in the best spot. 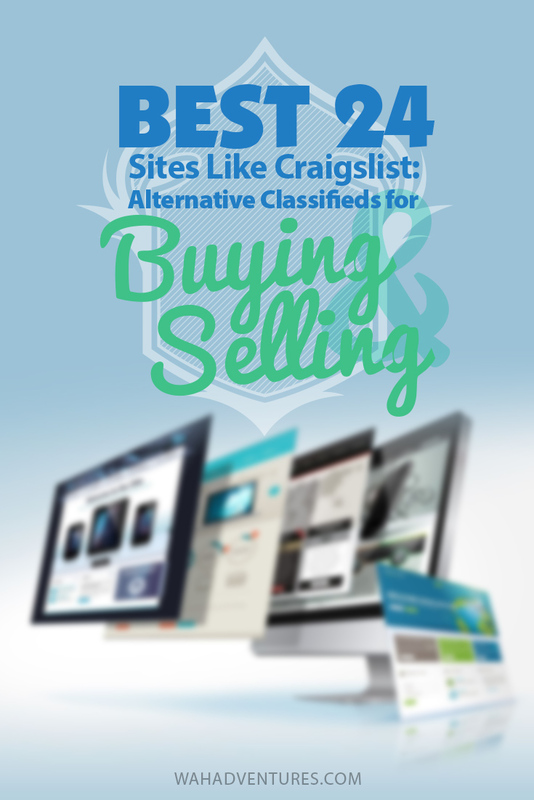 AdLandPro offers free classifieds like Craigslist. It also offers premium services, like listing advertising, placing your ad in its email newsletter, and automatic ad renewal. You can place up to 20 ads at a time and they’ll remain on the website up to 4 weeks, unless you remove them before that time. Ads Globe is a global classifieds website that offers free listings. You can view listings in your area or switch to another location; if you’re traveling and want to see what’s out there, it’s a good feature to have. I like how Ads Globe sets up its webpage to neatly categorize even its main categories into even broader categories so you can narrow down your search. The ‘Business Center’ section, for example, has the Services, Business Pages, and Business to Business categories. BackPage is set up much like Craigslist. It’s very simple, yet has a ton of main and sub categories. You can list in the United States, Europe, Canada, Australia, Asia and Pacific, Latin America and Caribbean, and Africa. You can post an ad without signing up, which makes it simpler, but also may attract spammers. Posting an ad to your location is free, but you’ll have to pay extra if you want to post to multiple locations for more exposure. City News offers free and premium ads for the US, UK, Canada, Asia, and Europe. Free ads offer all your basic listing needs for posting locally. Premium ads let you post in multiple locations and categories, plus gain extra exposure through featured listings, bolded text, or ‘bumped’ listings. Classified Ads is a clean, simple, and organized listing website for free ads. No need to register before posting an ad, but an account will be created for you once you create your ad. You can choose your expiration date for your ad and upload up to five pictures. If your ad is set to expire in three days or less, you can renew it to bump it to the top. Classifieds Giant actually has a pretty big user database with over one million ads posted at any time in its numerous categories. You’ll need to register for an account to post an ad, but it’s a quick process. Post your ad for free, upload up to 12 photos, and your listing will remain for 30 days unless you remove or renew it. Close5 is a little different than Craigslist in that it’s highly centered on its mobile app for Android and iOS. However, it works in much the same way: post ads locally for free or respond to other ads. You can, however, use the website if you choose, but the mobile app is an awesome way to quickly respond to other ads, or to your own ads, when you’re away. EPage Classifieds is one of the oldest alternatives to Craigslist, providing online classifieds since 1994. Its website is a little busy, but it has several categories and sub-categories to help you find what you need. Ads are free to post but you can choose to become a Gold member to gain access to more listings or have your listings stand out with formatting and priority options. Free Ads Time offers free ads for locations in US, Canada, Europe, Asia, South America, Australia, New Zealand, and Africa. You don’t have to register to post, but it’s recommended that you create an account or login with your Facebook account so you can track views, renew and modify your listing, and more. Featured ads are available, which let you post your ad in all locations, for just under $30 for a full month. Geebo has several locations across the USA to post your ads in. The website deems itself a safe way to post and browse listings, but as always, make sure you follow basic security rules to keep yourself safe when buying and selling. Gumtree is a UK-based classifieds site with a large following. It’s also a lot more polished than many of the other Craigslist-type websites out there. Ads are free to post, but you’ll need to register. There are also additional paid options that help you get your ads noticed, like making it a Spotlight or Urgent ad or adding a website link to your listing. Gumtree also has a mobile app for iOS and Android so you can keep track of your listings and browse others conveniently. Hoobly is an extremely simplified website similar to Craigslist. It started in 2003 and seems to be popular for its Pets classifieds, especially. You’ll need an account to post an ad, but it’s free. LetGo is a widely popular mobile app for iOS and Android devices, but you can also browse and list on its website. It’s currently only available in the United States, but there’s a wide range of US locations to choose from. The app helps keep you safe by only showing an approximate location, rather than your actual address, to buyers, so you never have to be worried about your home address being shown to others. LocalFind is a newer Craigslist-type site for the United States. You can post an ad for free and it usually will go live about 15 minutes after submitting it. You’ll need to create an account, or sign in with Google or Facebook, before posting. Locanto is a global classifieds website offering both free and premium ads. A premium account is just under $10 and lets you respond to reviews left by buyers, promote your ads, and more. Locanto also offers a mobile app for iPhone and Android users, so you can post and browse listings using your phone. OfferUp is similar to LetGo and Close5, as a buy and sell site with its own mobile app for iOS and Android. Using the app, you can post an ad simply by taking a photo with your smartphone. Add as much or as little details as you want, and it’s all for free. You’ll need to use the app, rather than website, to post your items. Oodle has online classifieds for the US, UK, Canada, New Zealand, Australia, India, and Ireland. Oodle is one of the best for preventing and handling spam listings and responses. You can contact Oodle if you suspect any abuse on your listings, or notice a listing that looks like spam. You’ll need to register to post a listing, which helps cut down on spam. Once you create a listing, you can even post it to your Facebook feed to let your friends know it’s active. Post free ads with Penny Saver USA, one of the few sites like Craigslist that let users post reviews for sellers based on their experiences. This helps weed out the bad scammers from good, honest sellers. Register to post an ad, and it will go live in about 15 to 20 minutes. If you’re browsing listings on Penny Saver USA, take advantage of its Clipboard feature, which lets you save the listings you’re interested in to come back to later. Recycler offers similar features of Craigslist, with several locations for listings in the United States. Ads are free to post, but you’ll need to register for an account or log in with Facebook. Free ads run from one to three weeks, and you can purchase additional options for longer-running ads or premium features. Recycler sends you a notification 48 hours before your ad is going to expire to remind you to renew, if needed. Trovit is available for a huge number of countries, including the US, Canada, and the United Kingdom, but it works a bit differently than most of the other sites on this list. Trovit focuses on Homes, Jobs, and Cars. Choose one, and then you can search through numerous sub-categories. Trovit pulls information from websites all over the internet to bring you a huge database of listings, almost like a search engine. So, you can’t post on this site, but if you’re looking for vehicle, real estate, or job listings, this is the place to go. It also has a mobile app for iOS and Android. The United States newspaper, USA Today, has its own online classifieds. As you can imagine, the USA Today classifieds have some great traffic, so you’ll likely sell your items fast or find the perfect item to buy. The website is very organized, so it’s easy to find the categories you’re looking for. However, note that listing your ad on USA Today online isn’t free. For 2017, the weekly rate is $40. Still, depending on what you’re advertising, it may be well worth the cost. You can also upgrade to a premium listing for an extra $25. US Free Ads is a bit sloppy, but it has all the categories you need to post a listing. It obviously has a good number of active users too, with some categories having 12,000 ads or more. Business Opportunities seems to be the most utilized category on this website, but you may have to weed out several scam opportunities to find the good ones. Post an ad for free and add up to 12 photos in your listing. Have any tips for using buying and selling websites like Craigslist or suggestions for other websites to use? Leave us a comment!